Scientists theorize that sulfurous compounds from ancient volcanoes helped warm up Mars and form the now extinct Martian oceans. Could electricity be a better explanation? 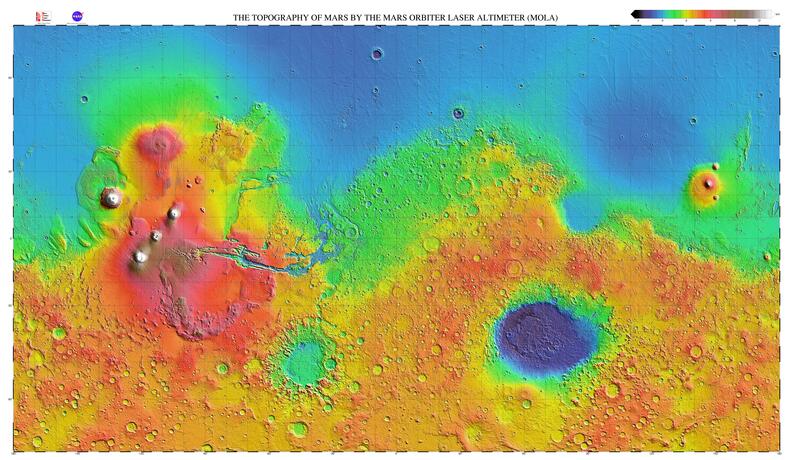 Speculations about the existence of liquid oceans on Mars have existed for centuries. Images from orbiting cameras supposedly confirmed that water once flowed on the surface of the now frozen and barren planet so the Mars Expeditionary Rovers A and B were sent for a close up look at the evidence. So far, after several years of traveling the Martian wasteland, no confirmation either way has been forthcoming. Some discoveries, such as the presence of olivine deposits on the surface, seem to preclude the existence of water on Mars since olivine is readily dissolved and dispersed in water. Any large deposits would have been washed away eons ago if there had been large quantities of liquid. Contrary theories have been presented that ignore specific mineralogical objections in favor of a larger view. Scientists from the University of California at Berkeley recently suggested one of the more interesting “confirmations” for the liquid ocean hypothesis. Although the oceans have been gone for over 2 billion years, their analysis of Martian topography seems to indicate that two “shorelines” extending for thousands of kilometers have been overlooked in past analyses of satellite imagery. As their theory states, crustal folds have obscured the true shape of the fossil coastline as the planet deformed during a change in its spin direction in the past. Due to some kind of imbalance in the mass distribution inside Mars the planet tilted over by at least 50 degrees on its rotational axis and caused distortions in the crust. Changes in thermal balance and increased exposure to the solar wind caused a lot of the water that once occupied the changing ocean basins to be lost. However, one-fifth of the Martian surface was once covered with water so there “must be” more water remaining, locked-up in the rocks or buried underground in giant blocks of ice. Another recent announcement states that “greenhouse gases” in the form of carbon dioxide with large percentages of sulfur dioxide and hydrogen sulfide, also contributed to the presence of liquid water oceans on Mars. Today, the average temperature on Mars is 46 degrees below zero C (-51 degrees F) with a mean surface atmospheric pressure equivalent to standing on top of Mount Everest. The atmosphere is frozen, dry and thin to the point where water would immediately sublime and disassociate, so somehow it must have been thicker and warmer in the past. The remaining carbon dioxide atmosphere points toward an older version of the planet with greater density containing more of the gas, according to conventional understanding. The problem is that no amount of carbon dioxide in the evolution of any planet is sufficient to warm up the atmosphere by itself. Coupled with the absence of carbonate-rich rocks in Mars, a mechanism for preventing their formation while at the same time increasing the atmospheric pressure and accelerating the “greenhouse” effect remained elusive. Now scientists are speculating that the volcanoes on Mars once erupted with tremendous quantities of sulfurous gases, acidifying the then extant oceans and preventing the formation of carbonates. Mars has a lot more sulfur than Earth (which also contains large deposits of carbonate rock), so the sulfuric acid dissolved away the limestone beds, for instance, while at the same time acting as a booster to the “greenhouse” environment. Earth and Mars are presumed to have been similar in the past so many explanations for why the two planets diverged into their disparate natural settings have been offered. 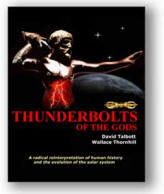 It is not surprising that electricity in the form of plasma discharges and lighting bolts has never been considered in the development of each world, but the observational evidence that we have offered in the Thunderbolts Picture of the Day and New and Views sections of this site is compelling.